Jackie Shaw is a social psychologist with key expertise in the use of visual and performative methods to drive and mediate participatory action research, community development and social change processes. Her research contributes critical insight on navigating the intrinsic tensions to build contextualised pathways to inclusion and influence from the social margins. She prioritises collaboration with disadvantaged and stigmatised groups, including women, people with disabilities, people who are homeless, refugees or nomadic, and others facing insecurity or discrimination due to ethnicity, sexuality, caste/class, health status, economics or geography. Jackie is currently Research Fellow in the Participation, Inclusion and Social Change Cluster, and IDS Research Ethics Convenor. Having worked for more than thirty years in a diverse range of community, international development and health contexts, she is an experienced participatory facilitator, consultant, project leader, senior lecturer and multi-disciplinary researcher. 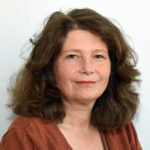 From 1984 she pioneered participatory media practices both as founding director of Real Time, a leading UK exponent, and co-author of Participatory Video (1997) the first definitive guide. Jackie’s PhD built nuanced understanding of practice realities, and she aims to stimulate critical reflection on the possibilities, challenges and ethics of visual and performative approaches (e.g. Shaw 2017, 2016). Jackie convened the Participate visual methods programme (2012-14), which collaborated in 30 countries to bring the reality of poverty into UN deliberations, and influenced the SDG call to leave no-one behind. Her current research uses evolving visual processes to build more inclusive dialogue and relationships within and across communities and between marginalised groups and influential stakeholders. She recently led research in Kenya and Indonesia on pathways towards social accountability (Making All Voices Count 2016-17), and co-led British Academy research on tackling exclusion by exploring how to navigate from understanding intersecting inequalities to accountable relationships in Egypt, Ghana, India, South Africa and Uganda. She is currently supporting Kenyan partners to apply participatory video processes and video-mediated dialogue to explore conflict in ‘green’ resource development contexts (Seeing Conflict at the Margins), and is working on 2 disability research programmes – Disability Inclusive Development (DID) and Inclusion Works. Jackie also has a long-track record in teaching and learning. Since 1990, she has provided practitioner and research training for professionals, community groups, and civil society and governmental organisations globally. She has taught on and directed qualitative and quantitative research methods programmes since 1995. Prior to teaching and supervising Master’s and PhD students at IDS, she contributed at LSE to Health, Community and Development, Health Communications and Critical Approaches to Development Communications Masters, and to the University of Reading’s Video and Development programme. She currently supervises PhD student Dilmurad Yusupov and welcomes potential students interested in using visual methods or PAR for community engagement, grounded research, collective action and to drive progressive power-shifting processes towards inclusion. This project focuses on the need to consider and address intersecting inequalities – the spatial, economic and identity-based drivers of poverty and inequality - if the Sustainable Development Goals (SDGs) are to be successful. Praxis and researchers from the IDS-led Participate Initiative have been working with India’s denotified tribes (DNTs) to challenge discrimination. Jackie Shaw reflects on how power dynamics within diverse group processes enable and constrain outcomes. Whilst the use of participatory video (PV) has expanded across the development sector, care needs to be taken regards its context, ethics and application. A new IDS course explores the techniques and practice of using PV for inclusive, community-led change. Participatory research processes hold inherent tensions, involving people with different levels of power in complex socio-political contexts. Visual methods offer great opportunities but can also amplify the many challenges to honest reflection and learning. Inclusion of the most marginalised people through addressing discriminatory dynamics is central to achieving the Sustainable Development Goals (SDGs). This research report considers how the intersection of spatial, economic and identity-based factors drive poverty and marginalisation. Where Does the Research Knowledge Lie in Participatory Visual Processes? Over recent decades there has been a rapid expansion in the use of participatory visual methods to unearth neglected perspectives on complex issues. As example, participatory video can enable participants to show and tell, and connect marginalised communities with external audiences. Can documentaries help us tell a different story about global development? This seminar, jointly hosted by IDS and the International Broadcasting Trust will explore these opportunities and challenges from the perspectives of film makers, researchers and NGOs.